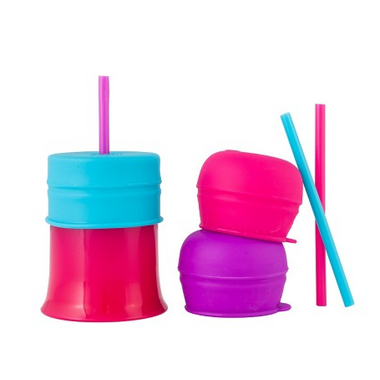 These are great and do fit over various cup shapes and sizes. The cup it comes with is nice and durable. The only thing I wish is that the straws were silicone as well. Love these! My second set because we lost a few. The best! I really like the concept... the lids fit on all my cups no problem and on small mason jars. The problem is with the suction. If you gently press on the top the liquid squirts out of the straw like a fun little volcano of destruction. I will not be using these for travel like originally intended but I will use for picnics and camping happily! 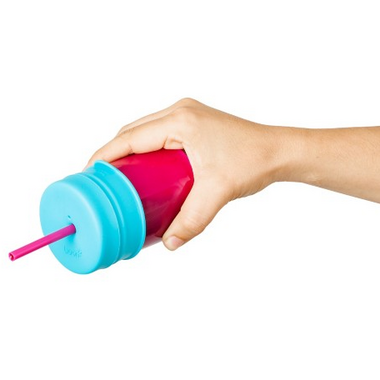 Product does fit well onto cup provided as well as most other generic kids cups, it does the trick but there are some flaws, if child squeezes the cup at all water sprays out like a water fountain haha which in theory is fun, it's messy for Mom and Dad.